Liberté Greek Seeds & Fruit Yogourt comes in two flavours – Strawberry and Pineapple & Banana and is packaged in 2 x 150 g containers. They are available at most major grocery stores and cost approximately $3.99. The folks at Liberté were kind enough to send out “Buy One Get One Free” coupons to my reviewers. I always enjoy setting up new products for people to review because I get different perspectives besides just mine. Plus it gives me a better idea of what healthy eaters value and are looking for. Check out the comments to see what they thought of Liberté Greek Seeds & Fruit Yogourt. Have you tried Liberté Greek Seeds & Fruit Yogourt? Let us know what you think in the comments below. It took me a while to find this product in grocery stores (I found it eventually at Longos after 4 other chains didn’t have it), and I loved it. I normally put seeds and nuts into my yogurt, so it was great that they were already added in, in a larger container. I tried only the strawberry and enjoyed it, liked the yogurt taste and texture and overall thought it was good. The 2 pack was $3.99 which is expensive, considering I can buy 12 packs of other grands for $4.99 sometimes. But, it was a good, tasty, and convenient snack. Creamy and crunchy in one bite! Yum. This product can be a great snack or a sensible dessert. I would recommend this product to others, and I would buy this product again when I am looking for an indulgent snack or a bit more fuel prior to a workout. I would rate this product 4 out of 5 because it is quite expensive, and because I think the product would still taste really great even with less sugar content. I typically only buy Liberte brand yogurts – plain, flavoured, Greek, Mediterranee – as I enjoy the taste and texture of the brand more than others. For this reason, I was super excited to try the seeds & fruit variety. I tried the strawberry flavour and it had the same great texture I enjoy. I found it was quite a bit sweeter than the other Liberte Greek yogurt flavours I buy. The seeds are a nice addition, however, I have always been adding my own nuts and seeds to yogurt so I don’t think it’s worth spending more for the convenience. I think I prefer to continue buying the regular Liberte Greek yogurt tubs and adding my own nuts and seeds. Overall, it’s a good product for those who need the convenience and individual packaging. What are your overall thoughts about the product from a healthy living standpoint? I loved the creamy rich texture and taste of this product. The portion size was just right for a snack and the nutrition information was fine. I didn’t like the sunflower seeds in the yogurt as I found they had become a bit soft which I didn’t like. I would recommend this product as an option for a snack. However, at $4.29 for two individual containers at my local store, the price point will likely limit who buys it. It will only be a treat for my household at this price. I tried a strawberry one, and it was okay. The texture was creamy and rich. I still consider it as “dessert yogurt” because it was sweeter than I want to have for everyday. Nuts and fruits are good addition to have, but I would add nuts and fruits on my own into greek yogurt. The price seems to be quite expensive (it was $4.29) for that 2 individual portions. So I would prefer to buy a big tub of greek yogurt and add my own nuts and fruits. If you’re on the go, it might be a healthy alternative and convenient. Thanks for sending the product coupon! It took me awhile to locate the product, but eventually found it. I sampled both the strawberry and the pineapple, and let my two kids try the second container. They loved it. They were not bothered by the texture, which I thought they might be. The products tasted like strawberry and pineapple yogurt. However, I wasn’t a big fan of the texture. I really nuts and seeds to be crunchy. The seeds in this product are soft because they are mixed in, but it still tasted good. I don’t think I would purchase this product again for myself, but as a dessert or treat for my kids. I would recommend this product to people as a dessert yogurt, as I found the sugar content to be the same a ice cream (which is why it tasted sooo good :-). My overall rating of this product is that it is a great once and awhile treat, but I wouldn’t recommend it as an everyday food item. It is a bit pricey, and a tad high in sugar to be consuming as a regular food item everyday. I like that is it 12 grams of protein, in that it didn’t leave me wanting more. Found the yogurt at Fortinos, then also saw it later at Walmart. Tried the strawberry one. I really enjoyed this yogurt. I like crunchy things in my yogurt, although rarely put them in myself (lack of time, don’t have something on hand, forget). Yogurt was smooth and fairly thick (in a good way) with crunchy seeds. Seeds were not mushy which I could see as being a challenge having it already mixed. Yes I would use it again and recommend it to others. From a healthy eating standpoint, the second ingredient is sugar….it has a tiny bit of fibre which other yogurts don’t (at least not what I’ve seen to compare to), good source of protein due to the “Greek” yogurt, and of course good for calcium. The container is also a bit larger at 150 g than other individually packed containers (~100g) and is therefore closer to one serving of your milk and alternative products. Looking forward to trying the other flavour! The product is sweet with two different textures: the yogurt is rich and smooth, while the seeds are nutty. 2. Would you use it again? To those who don’t mind the texture, I would as a dessert yogurt due to the sugar amount within the product. Can fit it in occasionally as a dessert yogurt. Agreed with a few others above that it was a bit difficult to hunt down this product (I tried No Frills, Loblaws, and Food Basics — eventually found it at Food Basics). Some stores have different prices based on flavor (i.e. The strawberry was $0.25 more, for some reason!). So to start, I LOVE greek yogurt for their higher protein content for the same volume. I’ve tried Liberte Greek (lemon, fruit bottom) before, and LOVED it, so I was super excited to try this new product (Seeds & Fruit). 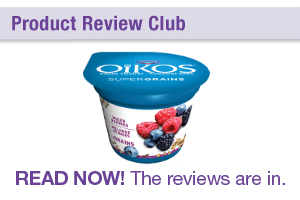 1) The product was good, but not as rich as the other greek yogurt. Because it was premixed, the taste is consistent, but a bit too sweet for my liking. I did like the crunchy + creamy texture though! 2) I might try it again if I needed a more filling snack or to supplement lunch (it’s 180 kcal, 12g protein for the 150g container). 3) I would recommend it for people who want to have a filling yogurt that is high protein and creamy. If they don’t like the richness of the usual Greek yogurt, then this would be your next go-to. 4) Overall thoughts from a health perspective, while it is a bit more expensive than the usual yogurt (about $4 for a package of 2), it gives you 2x (or more) of the amount of protein you usually get, and you’re likely to be full after eating this for a snack. Certainly a good snack option! 5) Overall, I’d rate it 3/5 (only because I’m comparing with the other Liberte Greek yogurt [which I’d give 4.5/5], and for the higher cost). I’d say it’s worth giving this a try and see what you think! I have seen this product on the shelves for quite some time at Save-On-Foods, but hadn’t bought it as I usually eat just plain yogurt or vanilla, mostly Liberte brand as well. I have tried their coconut greek yogurt, which was delicious so I was excited to hear about this opportunity to try one of their other flavoured yogurts. I only bought the strawberry flavour as I really don’t enjoy bananas mixed in with other foods, and it was delicious! I really liked how it was already stirred because I hate the fruit on the bottom yogurts, and the added seeds were a nice soft crunch. At home, I usually add muesli to my yogurt in the morning or the night before and have it with my lunch, so I am used to the subtle sort of ‘soaked in’ crunch as opposed to the drier crunch if you were to just add the seeds right before eating. I was surprised the flax seeds didn’t get more gelatinous, which was really nice because I was worried it would give a strange texture. The seeds are a nice addition and the mixture of seeds give a slightly different flavour with each bite so taste fatigue doesn’t set in. If you were to make something similar at home, you would likely only use 1 type of seed. Pumpkin seeds have to be my favourite with their high protein content, and flax seeds are great for added fibre, but since they are whole, the omega 3 content may not be as high. I’m not really sure how much seed is in each portion though, so in terms of a ‘portion of nuts and seeds’, I don’t think it compares. The size of the container is much more satisfying as a snack than the usual smaller containers so I really enjoyed that, especially with the added seeds. With a normal sized yogurt, I would normally have to pair it with something else, but this was a nice ‘1 stop shop’. I also really liked that it was 2% and not 0% because this low fat craze is driving me crazy and 2% is still lower in fat than the full fat traditional yogurts so it is a happy medium, and also will keep you satisfied for longer. I think I would use it again perhaps for trips or when staying out of town without my usual kitchen supplies. I would recommend it to others if they were having trouble with satisfying snacks, however it is still a stirred fruit yogurt, with added sugar, so there are healthier options. I think I would rate this product a 4/5 because it is delicious and satisfying but the sugar content is high. Thank you for the opportunity to review this product. I typically shop at Fortinos and have seen it there weekly. They carry both the pineapple/banana and the strawberry. I decided to try both of them. I really like both of the flavours. If I could choose only one of them, I would go for the pineapple/banana. The texture is creamy, but not to ‘sticky’ like some Greek yogurts. I would buy this product as an occasional treat. It is the kind of snack that I would gravitate to if I was craving something sweet. For me, the sugar content puts it into more of a ‘dessert’ or ‘treat’ category than an every day yogurt substitution. I would recommend it to clients who are not used to eating nuts or seeds with their yogurt. It is a good way to introduce them to this taste/texture. For people who are used to adding seeds to their yogurt, I would still encourage them to add their own to plain yogurt. It is definitely more cost effective to make it on your own. I would therefore rate this product as a 4/5! Thank you for the opportunity to review this product. I found it at Loblaws with no problem. I tried the pineapple/banana flavour. I really liked the yogurt (I love Greek yogurt and the extra protein it has compared to regular yogurt), the flavour was really nice. I was a bit disappointed in the amount of seeds in it though – I thought there would be more! The sugar content is a little high too and I think it could still taste great with less sugar added. I would recommend purchasing plain greek yogurt and to add your own seeds and fruit, to help lower the sugar content and to be more cost effective. I might add a bit more seeds to it as well (but keep in mind the extra calories this may give!). I do think it can be a great snack though as it is high in protein and kept me feeling satisfied for a few hours (and it tastes great!!!). I am going to give it a 3/5 for the sugar content and higher cost. Yogurt is a food I love, so I was excited for the opportunity to try a new yogurt product from Liberté. I am normally a plain Greek yogurt eater, as I enjoy the versatility of plain yogurt (it can be used for sweet or savoury dishes, and I can add in whatever flavours I want), so it was a bit different for me to buy a fruit flavoured product. I tried both of the flavours (strawberry and pineapple/banana). I must admit, I wasn’t overly excited about the flavour options – I wish they had kept the pineapple alone without the banana to muddle the flavour, and I found the strawberry flavour to be a bit fake tasting. But given that flavour of yogurt is a really personal thing, I didn’t hold that against them too much. – The portion size. It made for a good sized afternoon snack, unlike some single serve yogurts. – That it was 2% yogurt. So many yogurts out there are 0%, and they just don’t have a good mouthfeel to them. I want to see a little fat in my yogurt – it tastes better and is more filling. – The seeds weren’t crunchy. Because they are mixed in the yogurt they are soft. I want a definite texture difference, so I would rather add them myself. – The fact that it’s single serve. I really don’t like buying single serve products from an environmental standpoint, as they have more packaging. – The cost. At my store they were $4.09 for 2 yogurts, which is pretty expensive when you consider you can buy a container that will give you 3-4 servings for close to that price. Would I recommend them? Probably not. They aren’t bad, and if someone enjoys them instead of a candy bar, great. But I wouldn’t go out of my way to suggest someone buy them, as I don’t think they are economical, and I think adding your own seeds, nuts, fruits, etc is a better way to go. 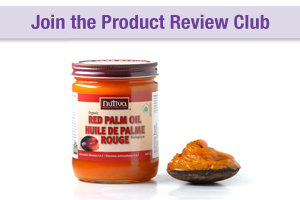 It was great to have the opportunity to review this product. First of all, I really like the originality of the idea and the interesting flavours. I can honestly say that I haven’t tried pineapple & banana flavoured yogurt before. I really think the tropical flavours lended themselves well to the yogurt. I also like the fact that the yogurt comes in a larger sized container. I grew up on the 175 g single serving tubs of container and the sizes of yogurt just seem to be getting smaller and smaller. The size and richness (2% M.F) of the yogurt makes is substantial enough to be a small breakfast as you head out the door. I thought the seeds were an interesting idea and is a good way to change things up. However, I do agree that the cost of the product is quite a bit more than the alternatives so I am not sure if it’s worth paying more for something that I could just do myself (and have the seeds stay crunchy). Having said that, I think the idea is great and perhaps if packaging changed so that the seeds were packaged separately and people could add it themselves (similar to how you can add granola to store bought yogurt parfaits that you might buy at a coffee shop), that would make a huge difference. Would I buy it again? Maybe if I had a discount coupon (because I do like the flavour and the larger serving size) or if I wanted to keep a couple in my fridge as ‘breakfast/on the go snack emergencies’ (i.e. when I have no time to make anything). Otherwise, I would just buy a large tub of plain yogurt and mix in my own granola.